Union Pacific re-launched its passenger train service in 1946, accelerating schedules, and expanding service in some cases. Among the changes was the adoption of a handsome two-tone gray scheme for the passenger car fleet. It was important to the UP that the train present a color coordinated image, so over 100 UP steam locomotives were painted in this scheme. Among the locomotives assigned to this service was the very last steam locomotives purchased by UP, 4-8-4 844. Built in December, 1944, the 844 was in its new colors by 1946. The two-tone gray image for UP passenger equipment was a short-lived program. In Spring of 1952, the order went out to re-paint the equipment into standard colors: armour yellow for the passenger cars and black for the steam locomotives. And that’s how it stayed through 1959, when the 844 was removed from regular service and became a part of UP’s Heritage Collection. Over the next 28 years, the 844, in black, would be the power for hundreds of excursions throughout the Union Pacific system. In 1987, the decision was made to return the 844 into the two-tone gray scheme. It made its debut in October 1987. 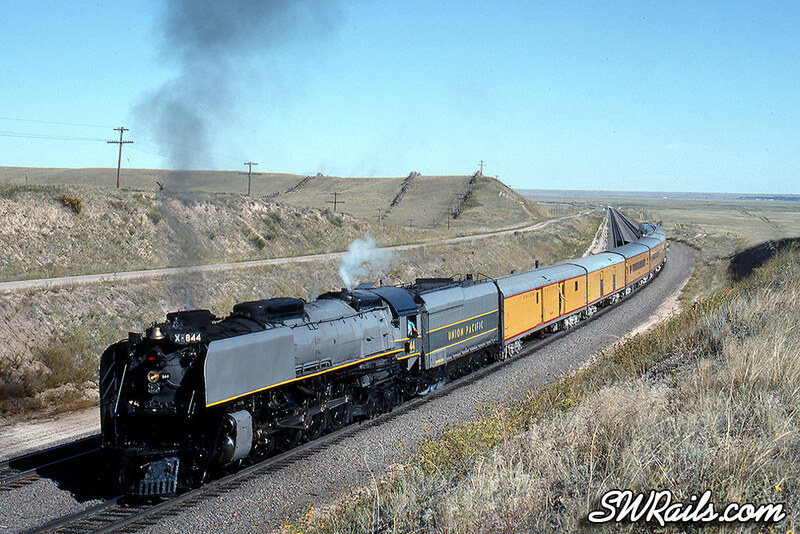 I was able to catch it on September 16, 1989 as it passed through Greer, Wyoming with a Denver-bound excursion train. By the time the 844 was nearing an overhaul in 1991, the decision had been made to return the 844 to standard black mainly because it was near impossible to keep the grey paint looking clean. It’s last run in the two-tone gray was October 20, 1991. P.S. – I found this video of the 844 that shows it operating the excursion train to Denver on the same day that I photographed it.